Many bunds will be built to meet legislation/best practice but can be damaged in accidents or poorly maintained which can cause problems that render them useless e.g. cracks. Often bunds are not designed correctly in the first place and are built with failures meaning the bund is not liquid tight. Defective bunding can be as bad, if not worse, than no bunding at all, as it masks leaks and gives a false sense of security. Over a period of time chemicals/oil leaching out of bunds can go unnoticed and lead to serious ground and groundwater contamination. We can repair all damage to bunds leaving them compliant at a fraction of the cost of replacing the bund. Cracks can occur over time e.g. weathering or suddenly e.g. following impact damage. It is essential to get the cracks repaired as they can allow materials to escape the bund, even hairline cracks will allow liquid to leach out over time. When repairing a crack it is essential the repairs do not compromise the integrity of the bund so that it can handle the internal pressure of a catastrophic failure. We are experienced at repairing cracks to the requisite standard ensuring this is done in the most cost effective manner. If pipe/ cable entries into bunds are unsealed/ineffectively sealed we can use our cable entry sealing expertise to ensure the penetration is effectively sealed. See our dedicated sealing entries into bunding page for more information. Brick built bunds will often allow material to leach out of the bund slowly causing contamination. This will usually be through the mortar or through wall-floor joint failures. We can prevent this by filleting all floor-wall joints and lining the bund with an appropriate primer and oil/chemical resistant coating. Often lining/relining a bund will occur to protect the substrate from the liquid it is storing. Many chemicals and oils will attack the bund walls and floor and can weaken the surface causing failures. It is essential that a risk assessment of the material is conducted in order to assess the requirement and type of lining needed. Certain materials are not suitable for bunds e.g. Breeze blocks; lining can often be a cheaper alternative to replacement. Bunds should be built to store a specific amount of a particular liquid. If your processes have changed it may be that the bund is no longer adequate. Our bund upgrades can ensure the bund is fit for its current usage. 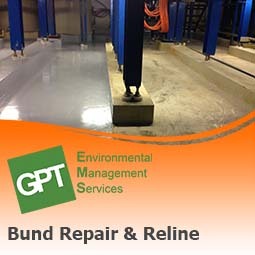 Our most common bund upgrades include increasing capacity where liquid storage has increased, relining the bund to prevent erosion from aggressive chemicals/oils where the material stored in the bund has changed and retrofitting a sump and an automatic bund dewatering device. We look at the whole picture when it comes to bunds, and would not make recommendations to repair a bund if it is not the most viable option. In some cases it maybe more cost effective to replace a single skinned tank with a integrally bunded tank rather than a repairing the bund. If you have identified defects with your bunds, or if they have been identified by external bodies e.g. environmental regulators or ISO 14001 auditors call us today to see how they can be repaired. (e) if any fill pipe, or draw off pipe, penetrates its base or any of its walls, the junction of the pipe with the base or walls must be adequately sealed to prevent oil escaping from the system." 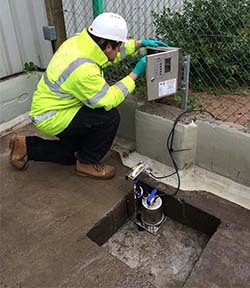 "Use a registered competent person to check your tanks, secondary containment and pipework every year .....To make sure a constructed bund retains its integrity, use a reputable company to repair any defects in the bund wall or lining promptly."